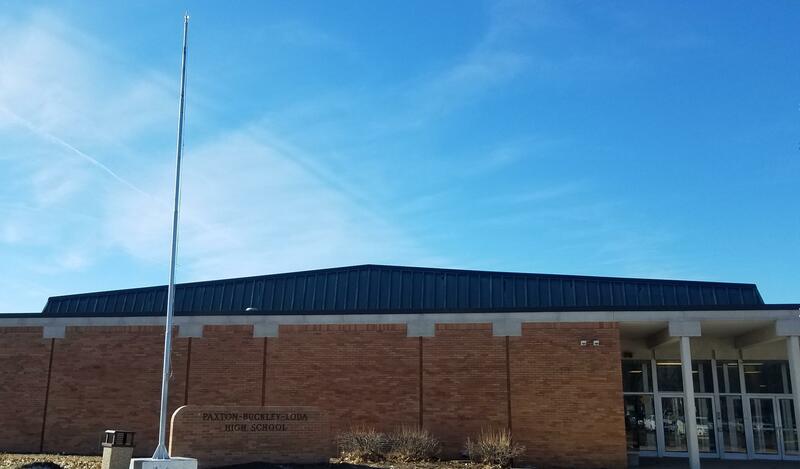 A flagpole stands near the entrance to Paxton-Buckley-Loda High School in Paxton. If Fire Chief Denny Kingren can meet his fundraising goal, a much taller flagpole will fly a giant flag, visible to motorists along nearby I-57. The fire chief in the Ford County town of Paxton says flying a giant U.S. flag from a tall flagpole would promote patriotism and his community at the same time. Denny Kingren, the longtime fire chief of the Paxton Fire Protection District, says he’s seen other big flags on tall flagpoles in Wisconsin and Michigan, and Illinois, where the city of Princeton in Bureau County flies flags from four tall flagpoles along I-80. Kingren says he hopes a giant flag can be a memorable landmark for Paxton in the same way as the 198-foot-tall cross that stands over I-57 in Effingham. “That always kind of stood out and made me think of Effingham,” said Kingren. “And I thought Paxton could use a little something to make us stand out a little bit on the map, showing our patriotism and support of the American flag. Kingren’s proposed Paxton Grand Old Flag project would fly a 30-by-60-foot flag on a 150-foot-high flagpole set up along I-57. He has secured permission to erect the flagpole on the grounds of Paxton-Buckley-Loda High School. A fundraising campaign for the project is expected to get its formal launch next month. Kingren says the campaign will likely include the sale of bricks bearing the names of donors or their loved ones for a special sidewalk leading to the flagpole. He estimates that $55,000 will be needed to buy and erect a flagpole, and purchase flags. He says multiple flags would be needed each year, but that the flags can last longer if properly maintained. Any one interested in getting involved with the fundraising effort can call Kingren at 217-202-6398.